Demand for videos about health is growing. And the empowered healthcare consumer is actively seeking the content. In fact, according to The Digital Journey to Wellness, 77% of patients used search engines before booking an appointment. With YouTube as the world’s second largest search engine, it’s clear that video content can be highly effective when incorporated into the patient journey. Using Google AdWords, you can place your content in targeted videos based on what a viewer on YouTube is searching for. You’ve probably experienced this: you go to watch a video and suddenly, here’s a commercial. These video ads on YouTube are called in-stream or pre-roll video advertising. Determining the type and placement of your video content depends on what phase of the buyer journey your target audience is in. a. The goal of video content in this phase is to get on consumers’ radars before they have healthcare needs. Content should be educational in nature as it will help position you as the authority in your area of expertise which, in turn, will support your patient acquisition goals. a. Consumers in this phase are actively researching a need or specific health problem. The goal for this content is to provide credible expertise directly related to a relevant keyword search. This can include health topic based educational videos that provide useful information to your potential patients who are researching a related topic. Longer format videos can also be shortened for use in social media campaigns. a. Your patients have done their research and they are now actively searching for a provider who can help them solve their problems. Video content in this phase should be designed to entice action. Content includes patient testimonials, a tour of your practice or organization, or a specific service line feature. This is the last and final stage of the patient acquisition journey. 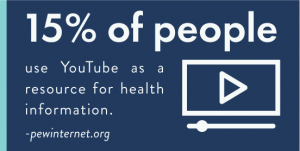 Ready to see what YouTube advertising can do for your healthcare organization? Give us a shout!